I received a pawsome package full of wonderful Petmate travel items for my BlogPaws trip! The package was from the Topcat or CFO (Chief Feline Officer) at Petmate, my pal @MarbleSays. 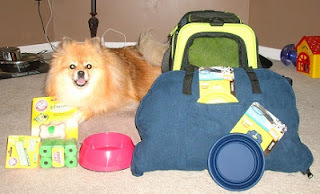 Marble knew I wanted some nice products to make my BlogPaws trip comfortable. Inside the package she sent was the See & Extend Carrier that I saw at Global Pet Expo. She must have heard me woofing about how much I wanted one. There are travel bowls to match it too! Marble also included this furrific Zip & Go Bed so that I would have a soft place to nap in the hotel. She is so thoughtful! She threw in some Arm & Hammer Essentials odor control biodegradable poop bags so that the humans would be happy. BOL! Mom likes odor control poop bags when we are traveling. She thinks it is more considerate for the people around us. Marble even added a pink dishwasher-safe bowl for at home because she knows I love pink. She is so sweet! Mom checked to be sure I could fit comfortably inside the carrier before she packed everything for our trip. The See & Extend Carrier is 18 inches long, 11 inches tall, and 11 inches wide (when the extension is closed). 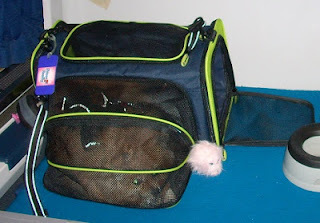 In this photo, I am inside the carrier (with the extension closed). The See & Extend fits inside my stroller! 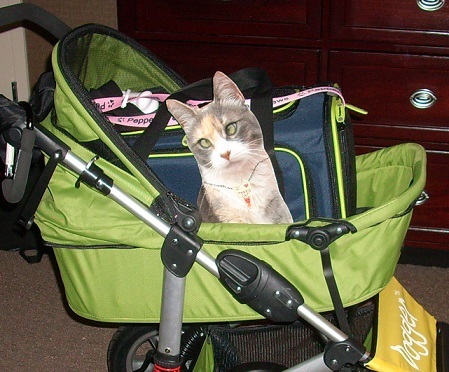 This is pawfect for those times when I refuse to get out of my carrier, and we need to hurry to a meeting. BOL! 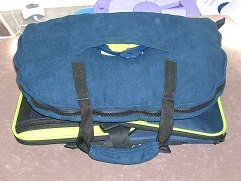 The See & Extend Carrier has both a shoulder strap and side carry handles. It also has 4 rubber "feet" on the bottom. The more I explore the See & Extend, the more I find to love. When the extension is open, the carrier has a lot more legroom. The extension allows me to move around more, see out of different "windows", and stretch out my legs. I can fit most of myself inside the extended part. It reminds Mom of the slide out parts on motor homes. BOL! The extension is made of See & Go mesh. The front and top "doors" are also made of See & Go mesh. See & Go mesh is strong, but easy to see through. The extension has a zipper opening where you see Scruffy poking his head out. You use this opening to zip and unzip the flap that separates the extension from the main area of the carrier. This zip open flap provides a smooth wall inside when the extension is closed. You need to open the flap to be able to use both the main area and the extension area together. 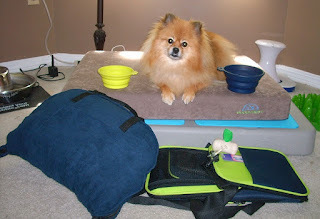 The See & Extend Carrier is pawsome!! I love the extension! Comfy nap spot in the hotel. The Zip & Go Bed is soft & comfortable with plush fleece on one side and microfiber on the other side. It is machine washable. The Zip & Go Bed folds in half and zips closed. It has a side pocket and carry handles for extra travel convenience. You know you can never have too many pockets or handles when you try to carry a lot of stuff. Did I mention that Mom is a heavy packer? BOL!! Mom tries to fit as much stuff as she can into as small a space as possible. 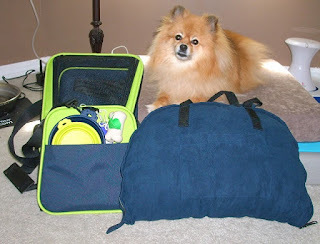 Naturally, she is thrilled with special travel products that use less space when packed, but still satisfy full sized needs when we reach our destination. 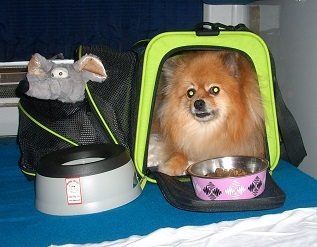 All of the furrific Petmate travel items have this feature! The soft silicone travel bowls expand when you want to use them. Then they collapse flat so that you can put them in a handy pocket, like on the Zip & Go Bed. They also fit in the back pocket on the See & Extend Carrier. The travel bowls are available in 2 sizes. The small bowl holds 1.5 cups, and the large bowl holds 3 cups. You can get both sizes in blue or green. I have the small green, and large blue travel bowls. The Zip & Go Bed is also available in 2 sizes. I have the small size; it measures 20 inches wide by 24 inches long - when it is open. It folds to 20 inches by 12 inches. The large size measures 29 inches wide by 42 inches long - when opened. 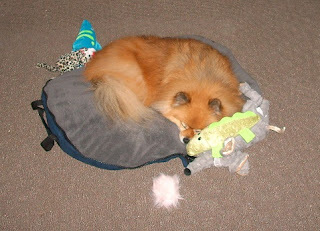 Mom was unpacking from BlogPaws, and couldn't find my Zip & Go bed. She knew she had packed it. Look where she found it! In the outside pocket of the big suitcase. BOL! Usually only little things go in the outside pockets. 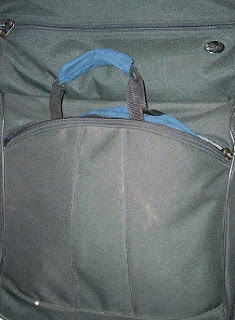 When you unzip both the front and back walls of the See & Extend Carrier, it folds flat. When you fold all of the travel products, they can be stored together in less than 20 inches of space. They will fit inside a drawer, or under the bed. 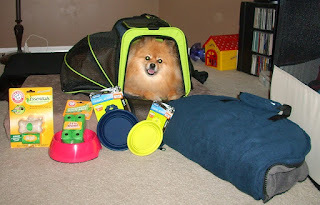 I love my Petmate travel products! 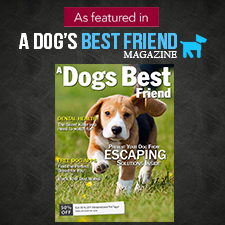 I saw that Modern Dog magazine is giving away 3 Petmate See & Extend Carriers during the week of June 15 - 21, 2013! Thank you! I love them too! BOL!! 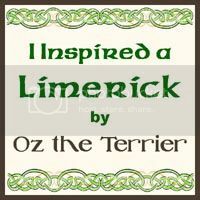 My mommy is a sucker fur bags and carriers and pockets and stuff, BOL!! She says the Petmate products are furry cool. Too bad we're too big to make use of most of them! Pepper you certainly look great in your See and Extend Carrier and the roll up bed that came along with it. Wow when it is in your stroller it matches perfectly with your stroller. An excellent review on covering everything about it. Thank you! It is pretty cool how it matches my stroller :) BOL!! I am very pawleased with all of the Products in this review. I REALLY like the See & Extend Carrier. I would stay in it most of the day if Mom were to open it up at home. If that carrier is airline approved, it would be purrfect for me. 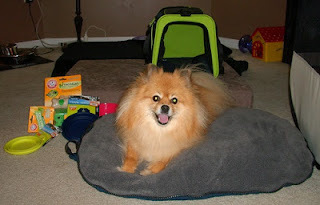 I might fly to Blogpaws next year. 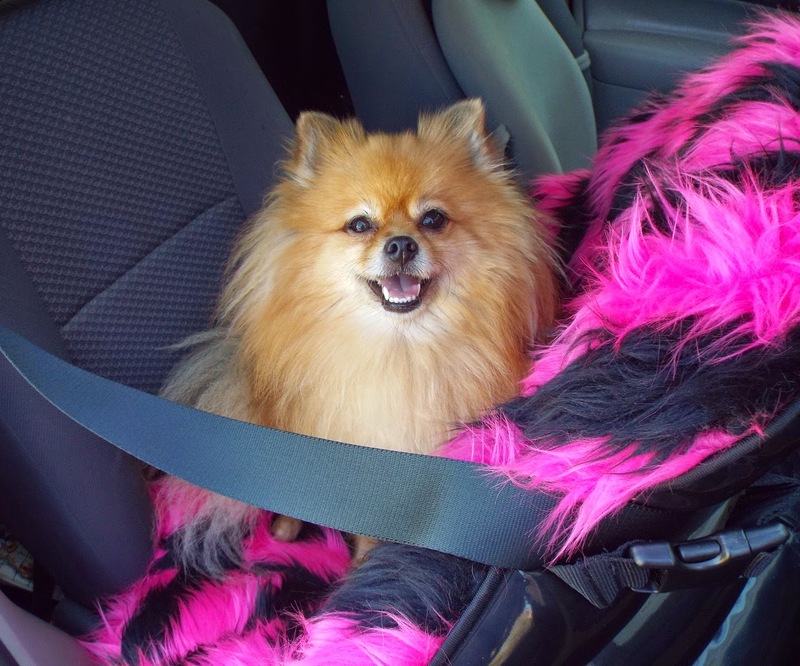 Mom would also really love something for the car that's not as big as the kennel, has a strap for carrying, but would give me more room in the car than a standard carrier. Wonder if they'd send me one to review? Hmmmmm. 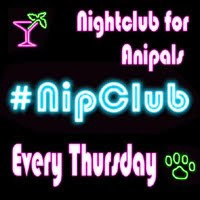 It is pawsome! You will love it! Oh Pepper! You're living the good life!! :) I suppose I am! BOL!! I enjoy my work! :) BOL!! BOL!!! Glad my mom isn't the only one to see the resemblance. BOL!! High Paw! LOL! You're definitely right about it resembling the slides on our RV! It definitely fits your busy, busy, busy lifestyle, Pepper!